A SpaceX Falcon 9 stands ready for launch from Cape Canaveral Air Force Station, Fla. The Air Force awarded a contract for Global Positioning System (GPS) III Launch Services to SpaceX, April 27. Space ExplorationTechnologies Corporation (SpaceX) was awarded a contract for Global Positioning System III Launch Services. This is a firm-fixed price, standalone contract with a total value of $82,700,000. 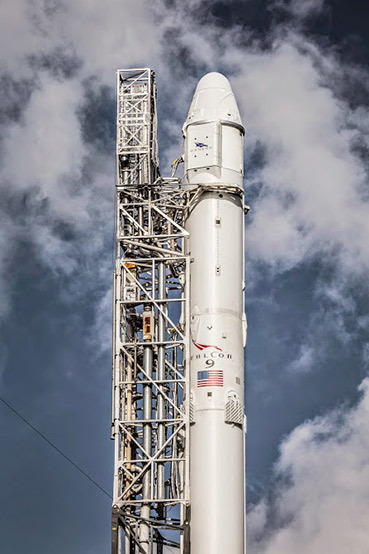 SpaceX will provide the government with a total launch solution for the GPS-III satellite, which includes launch vehicle production, mission integration, and launch operations and spaceflight certification. The launch will be the second GPS III launch and is scheduled to launch from Cape Canaveral Air Force Station, Fla., in May 2018. “This GPS III Launch Services contract award achieves a balance between mission success, meeting operational needs, lowering launch costs, and reintroducing competition for National Security Space missions,” said Lt. Gen. Samuel Greaves, Air Force Program Executive Officer for Space and commander of the Space and Missile Systems at Los Angeles Air Force Base, Calif. This is the first of nine competitive launch services planned in the fiscal year 2016 President’s Budget Request under the current Phase 1A procurement strategy, which covers awards with fiscal 2015-2018 funding. The next solicitation for launch services will be for a second GPS III satellite. This award marks a milestone in the Air Force’s ongoing efforts to reintroduce a competitive procurement environment into the Evolved Expendable Launch Vehicle program as directed by Frank Kendall, Under Secretary of Defense for Acquisition, Technology and Logistics. The Phase 1A procurement strategy reintroduces competition for national security space launch services. Under the Phase 1 strategy, United Launch Alliance was the only certified launch provider. In 2013, ULA was awarded a sole-source contract for launch services as part of an Air Force “block buy” of 36 rocket cores that resulted in significant savings for the government through fiscal 2017. In May 2015, Space Exploration Technologies (SpaceX) was certified for EELV launches resulting in two launch service providers that are capable to design, produce, qualify, and deliver a launch capability and provide the mission assurance support required to deliver national security space satellites to orbit. The certified baseline configuration of SpaceX’s Falcon 9 Launch System to Falcon 9 Upgrade was recently updated for use in National Security Space missions. The Space and Missile Systems Center is the U.S. Air Force’s center of excellence for acquiring and developing military space systems. Its portfolio includes the Global Positioning System, military satellite communications, defense meteorological satellites, space launch and range systems, satellite control networks, space based infrared systems and space situational awareness capabilities.